When? 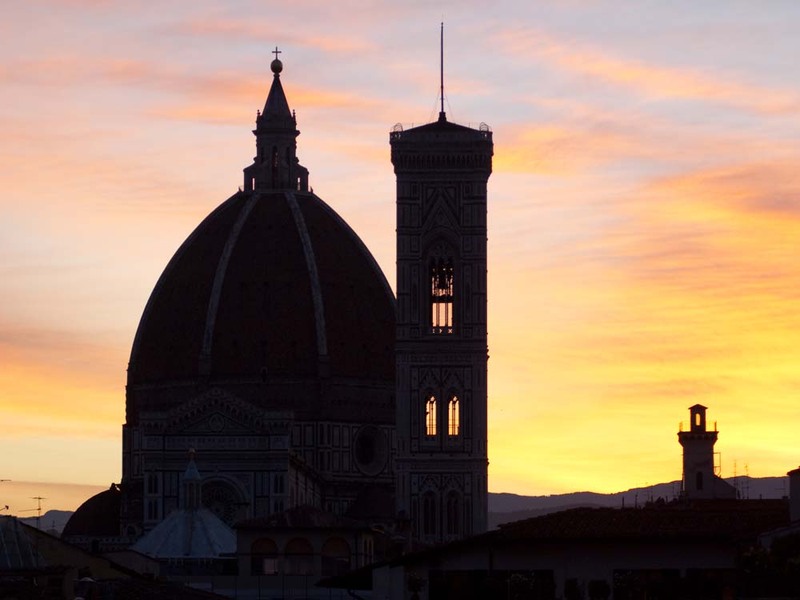 Face it: Florence is always busy – it’s a world-famous tourist attraction. As a rule Tuscany feels more relaxed in spring and autumn, but if it’s heat you’re after, go in June to August. You really must… Tours often start at the viewpoint over the city from the Basilica di San Miniato al Monte or the lower and busier Piazzale Michelangelo. Take a bus or taxi up there then walk back down to the river. With so much to see it helps to have a few targets to aim for, but check out opening days and times first. 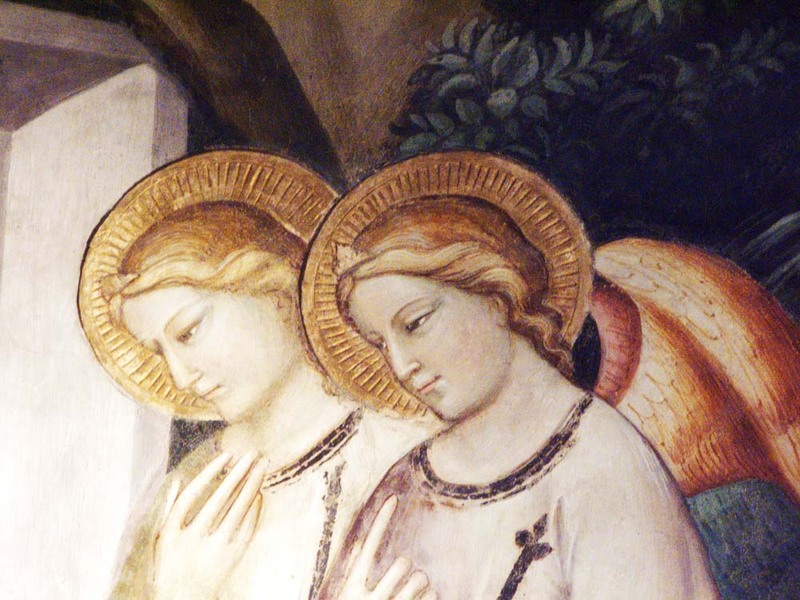 We like the Museo di San Marco (polomuseale.firenze.it), a Dominican monastery with marvellous 15th century paintings by Fra’ Angelico, and it’s not far from the Mercato Centrale where you can then have lunch. If you’re into fabrics don’t miss the glorious Antico Setificio Fiorentino (anticosetificiofiorentino.com), an enchanting silk-weaving workshop founded in 1786. Now owned by menswear designer Stefano Ricci it produces just one metre a day of exquisite handwoven cloth mainly used in grand homes and superyachts. Two fashion history museums worth a look are the shoe-heaven Museo Salvatore Ferragamo (ferragamo.com/museo), which tells how the dynasty began here when its eponymous founder came back to Italy from Hollywood in 1927. The Gucci Museo (guccimuseo.com) has an equally compelling story of how in the 1920s Guccio Gucci was inspired to make high quality leather luggage after working as a lift boy at the Savoy hotel in London. 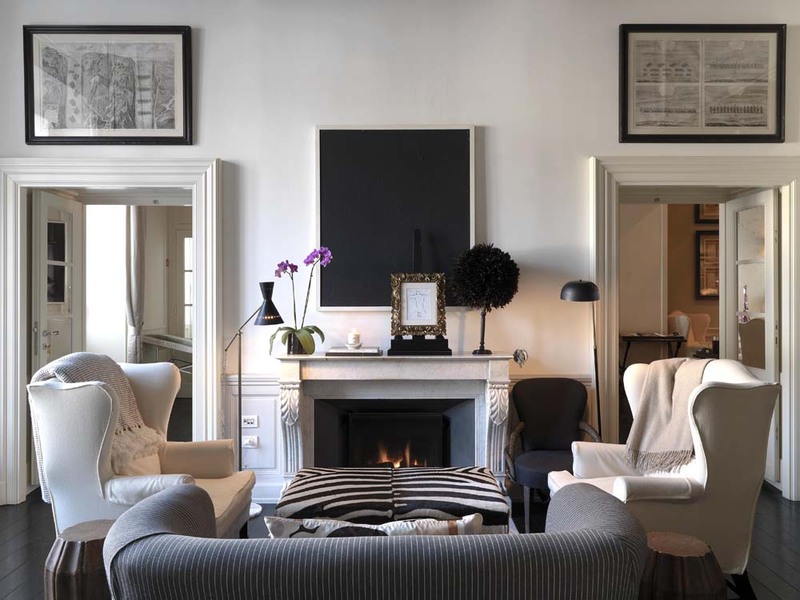 Stay at: J.K. Place Firenze (doubles in April from £394 with breakfast; jkplace.com) is a smart townhouse hotel in the enchanting Piazza Santa Maria Novella with a sophisticated décor of architectural prints and fashion drawings. The 22 rooms are plush and pampering and set on four floors with a penthouse offering superb rooftop views. Monogrammed linen and cashmere throws, glistening bathrooms and immaculate furnishings – it’s very much a place for high romance and the bar, lounge and restaurant attract a classy local crowd. Breakfast is served at a communal table downstairs or in your room, and you get a complimentary minibar with soft drinks and snacks. The hotel also produces a handy J.K. Essential Guide to Florence for the guidance of guests. 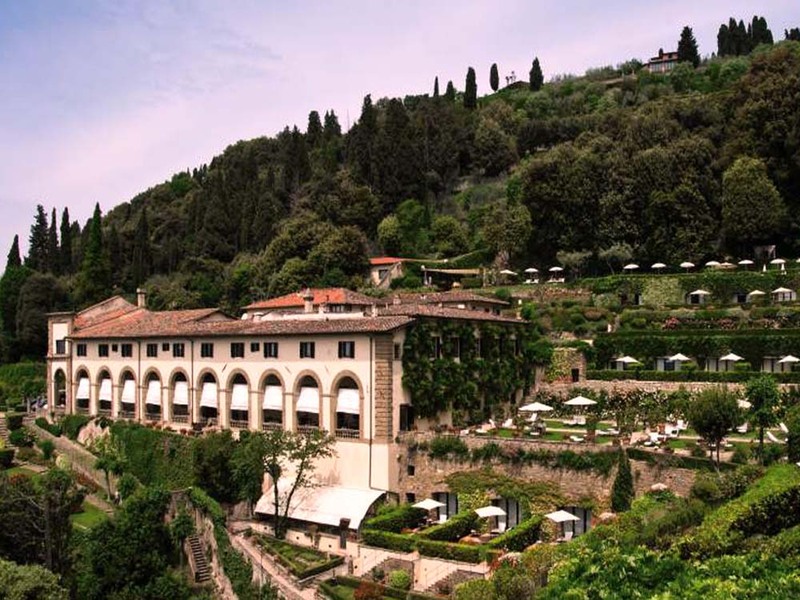 When you want to escape the crowds, summer heat or get some country air, take off to the Belmond Villa San Michele (opens 7 April; £558 with breakfast; belmond.com), a twenty-minute drive northeast in Fiesole. Once a Franciscan monastery, with a façade attributed to Michelangelo, it’s now a five-star hillside sanctuary with 45 rooms and suites set in gorgeous terraced gardens with a 25 metre pool. The views back to Florence are magical, and while there’s a free shuttle service if you need to pop in most guests prefer to hole up here taking advantage of its pampering rooms, cookery school and summer kids club. The long terrace restaurant has an old school formality (ladies get menus without prices, there’s a choice of ten desserts and 14 cheeses); breakfast and lunch are the best times to enjoy the views, while dinner (£66) is a long, civilised affair served by genial uniformed staff. Dine at: Restaurants in heavily-touristed Florence are a mixed bag and it’s a good idea to take a snacking approach rather going for grand meals in fancy restaurants that get very excited about massive steaks. Panini, pizza, aperitivi and apericena (where bars throw in a buffet) will usually do the trick and leave space for a yummy ice cream from a top gelateria like La Carraia (lacarraiagroup.eu). The terrace of the J.K. Place Firenze hotel (see above) is a good spot for lunch beside the traffic-free Piazza Santa Maria Novella, while the first floor of the Mercato Centrale (mercatocentrale.it) is packed with buzzy eateries. Bring home: Check out the stylish hats from Grevi (grevi.com) and the funky gifts, jewellery and home accessories in nearby Mio (mio-concept.com). Everyone loves the lotions and potions from the Officina Profumo Farmaceutica di Santa Maria Novella (smnovella.it), which has been sorting Florentines out since 1612 and is also a museum and tea shop. Leather gloves, olive oil and stationery are other good buys, while for high fashion take a saunter down Via de’ Tornabuoni. Book now: For the many flight options to Pisa and Florence see skyscanner.net. Taxis from Florence airport to J.K. Place Firenze take around 15 minutes and cost £15, and to Belmond Villa San Michele around 40 minutes (£40). For car hire see carrentals.com. Info: Florence & Tuscany (£14.99; Lonely Planet) covers the region. Useful websites are firenzeturismo.it, turismo.intoscana.it and discovertuscany.com.